When Hurricane Harvey ravaged Houston last August, the Astros were enjoying close to full-season dominance atop the American League West standings. How this young baseball team inspired a home city under extreme duress made for a compelling narrative and, in my view, a can’t-miss book from a journalist with strong ties to the organization who was able to capture the inside story. I remember reaching out to a couple of baseball writer acquaintances with deep relationships among many of the Astros’ front office executives who I knew could provide the context a story like this deserved. They both laughed, saying, “Thanks, but I know Ben’s got it already.” They couldn’t have been more spot on. In Astroball, Ben Reiter, a senior writer for Sports Illustrated, delivers a worthy follow-up to his 2014 cover story, which may have destroyed the so-called “SI cover jinx” forever. Almost four years ago, Reiter wrote a piece detailing what was at the time baseball’s worst team, illuminating the “process” of the St. Louis Cardinals’ former vice president of baseball development, Jeff Luhnow. The piece carried the cheeky title, “Your 2017 World Series Champions.” The story made the cover of the magazine, and the player pictured proved prescient: Astros outfielder George Springer would go on to receive the Series MVP award. The book picks up where classics of the genre like Moneyball left off. Like the now-legendary Michael Lewis tome, which pitted front-office quantitative analysts against old-school scouts, Astroball depicts the quest of Luhnow and his assistant Sig Mejdal, whom he brought with him from his tenure with the Cardinals, to incorporate decision-science into the core statistical assessment of players. Sometimes the process of player evaluation succeeded wildly, as when he team’s statistical brain trust (known as “the Nerd Cave” in the book) took a flyer on free agent pitcher Charlie Morton. The decision came after they realized the spin rate on Morton’s curveball was among the highest in the game even as he toiled through an injury-plagued 2016 season with the Philadelphia Phillies. But sometimes the residents of the Nerd Cave over-thought their assessments. When a player of middling success begged everyone in management for a spring-training opportunity to show off his newfound hitting mechanics, Luhnow and company basically ignored the player’s pleas, releasing him at the end of spring training in 2014. The player? J.D. Martinez, who currently leads the American League in home runs and sports a 1000+ OPS. Reiter opens the book with a quick refresher on the Astros franchise history and its visionary founder, Abe Hofheinz. “The Judge” as he was called, Hofheinz was a former mayor of Houston who believed a baseball franchise could bolster the city’s standing among the elite of the country. The sense in major league baseball circles was that the Texas climate was too humid for the summer game, which led to one of the greatest architectural creations in American history, the Harris County Domed Stadium, or as it was quickly renamed, The Astrodome, where the ballclub would play its home games from 1965 to 2000. The attraction was so popular, tourists paid $1 just to visit the dome on off-days, drawing over 400,000 people during its first year of existence. The Judge’s financial journey is a fun piece of history, especially the tidbits about the Astrodome penthouse. Fans of Cardinals recent history may enjoy the chapter devoted to Mejdal’s hiring. The book details his time working with Luhnow in St. Louis from the summer of 2004 to 2011, where the duo incorporated the ideas and processes made famous by Billy Beane and the Oakland A’s. With greater resources than the subjects of Moneyball, Luhnow and his team were able to not only bring a World Series title back to St. Louis, but also replenish the farm system. Luhnow, a McKinsey consultant at the time, was a hire of team owner William DeWitt Jr., which didn’t exactly sit well with his new colleagues in the front office who were unhappy that a non-baseball man held the affections of ownership. Reiter illustrates nicely the corporate politics of Luhnow’s years in St. Louis, complete with an old guard defending its turf amid an owner’s revised vision, and contrasts Oakland’s innovative thinking, largely borne of necessity and a dearth of resources, with that of a successful franchise pivoting to a new approach as ownership aggressively sought fresh ideas. Growth plays a significant part in the book’s narrative. Luhnow and Mejdal pursued players who possessed a “growth mindset.” It’s one thing to present a player with a plethora of data and information to enhance his performance; it’s another for young players to possess the desire to incorporate these suggestions into his game. What’s fascinating about Astroball is not just that the team’s approach to information, along with acquisitions from the ranks of Baseball Prospectus, led to a highly educated organization; that isn’t so unusual in a modern front office. Rather, what resonated was the amazing depth of the data the front office used to enhance player performance. 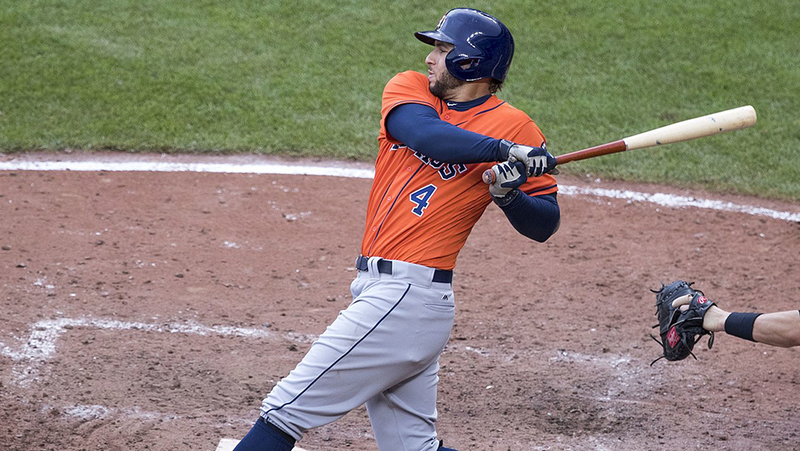 A detailed analysis of George Springer’s high early strikeout totals is one example that stood out. Reiter explains how the team analyzed Springer’s patience at the plate, drilling down into his strikeout totals to discover that the young hitter mostly swung at good pitches. This created a promising baseline from which to begin, once again, a process. I particularly enjoyed Reiter’s exploration of high school scouting. He details the debate surrounding Carlos Correa, which centered on whether the level of prep competition he faced in Puerto Rico provided a precise enough gauge of his ability to perform at a higher level. He also the explores the fact that Mejdal incorporated relatively few high school stats into his algorithms to determine draft-worthy players. Reiter’s book doesn’t make mention of the changes the Astros made to their scouting department. A critical discussion of those changes, how they affect the kind of amateur scouting done with young players, and how the Astros’ contrast with other well-run organizations like the Astros eventual World Series opponent, would have been worthwhile. I remember a Mike Schmidt remark from long ago that scouts will hardly “look at high school hitters if his average isn’t above .400.” Reiter smartly references the drafting of Mike Trout, who was ignored in the first round of the 2009 draft by many teams because he lived in Southern New Jersey, where a handful of games are rained out (and occasionally postponed due to snow) every year. These sections aren’t perfect. Reiter does his part by recounting the Astros drafting of Brady Aiken and how it affected Luhnow’s dealings with another high school pitcher, Jacob Nix, but a discussion of these sorts of negotiations could have been featured much more prominently, especially considering Aiken’s eventual trajectory. What are the drawbacks of the book? Former Astros manager Bo Porter, Luhnow’s first dugout hire after replacing holdover Brad Mills, is hardly mentioned, garnering fewer than seven pages of coverage, which is the same number as A.J. Hinch, skipper for the 2017 World Series champion. In a book that examines the role of data blended with “gut feels,” it would’ve been interesting to hear Porter’s view of the organization’s philosophy at the point of his hiring, during his tenure, and then after his dismissal. Even current manager Hinch is hardly quoted in the book, and there is very little exploration of the different management styles of the two men. What has Hinch done differently than Porter inside the clubhouse? Has that enhanced the product on the field? Those questions are left unasked and thus, largely unanswered. The other issue I have is with the explanation Luhnow gave for his process for finding a new manager after Porter was dismissed. “Are you okay with me sending down the lineup every day,” the general manager supposedly asked the 10 candidates he interviewed for the position, adding that saying “yes” was the wrong answer. I would’ve liked to have known how Hinch, with his Stanford University education and the organization’s desire for pedigreed personnel, answered this question. Which brings me to my prime takeaway from Astroball. The book paints a rich portrait of a championship season, but I believe history will remember this as the book that showcased Carlos Beltran’s potential as a manager. The portrait Reiter paints of the former outfielder is one of patience and understanding, with a willingness to teach, a thirst for learning, great affection for younger players, and a brilliant observational eye for pitchers on both sides of the diamond. After the Astros won the 2017 World Series, Beltran had been among the candidates to replace longtime New York Yankees manager Joe Girardi, following his dismissal after 10 seasons with the organization. Although GM Brian Cashman offered Beltran an opportunity to join the front office after selecting Aaron Boone, the longtime star decided to take a year away from the game, to spend time with his family and see how much he missed the baseball world. In addition, Beltran helped 2014 team ace Dallas Keuchel adjust his pitching motion to avoid tipping his pitches. He also advised Springer to slow down his swing, a swing which ultimately produced 34 home runs. The book credits Beltran with a significant slice of the mental growth for the Astros young roster. If Reiter’s book is any indication, I’d expect to see Beltran back in a dugout soon. Books like Moneyball, The Extra 2% and Big Data Baseball offer an exhaustive, educational portal into the analytical side of the game, providing their readers with a deeper appreciation of how the modern day baseball organization is composed. Ben Reiter’s Astroball should sit alongside the best of the genre. It’s a compelling story, well told and smartly rendered. Great write up. I’ll have to pick up a copy.